You’d think that a house nestled on a bluff 500 feet from the Pacific Ocean would be an exercise in money-to-burn indulgence. Think again. The “house” is actually two separate structures: a 1,250-sq.-ft. house and a 1,460-sq.-ft. studio where McKenzie sculpts, weaves tapestries and with Halley, designs home furnishings. Halley also designs house, specifically the passive solar variety. An open walkway connects the two buildings. Designed in collaboration with Berkeley architect Donlyn Lyndon, FAIA (one of Sea Ranch’s originators), the compound is sited on half-acre lot, with views of the meadow and the ocean beyond. 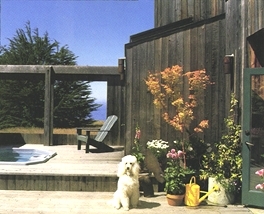 In keeping with Sea Ranch’s environment-conscious design philosophy-in which houses, says Lyndon, ” become part of the landscape”-both structures are clad in unfinished redwood siding, with roof lines angled to attenuate the strong ocean breezes. Windows and skylights are strategically placed to capture the sun and frame the views. The savings start with the house’s post-and-beam construction. The massive Douglas fir post and beams and the planks that sheath the walls set the space’s rustic tone and eliminate the need for plasterboard. “The wood of the house itself is the interior finish,” architect Lyndon points out. 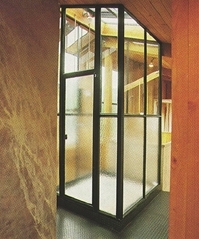 An array of double-glazed windows-some mounted high, others low-ensures interior light throughout the day. The resulting passive solar gain allows the home and the studio to be heated with only two wood stoves-one in each space. (Slate pavers measuring 16 x 24 inches on the house’s first floor soak up the sun and radiate warmth at night.) The net result: reduced monthly bills for both fuel and electricity. McKenzie chose unadorned industrial fixtures and materials to complement the home’s rough-hewn feel; and here, too, she found considerable savings. 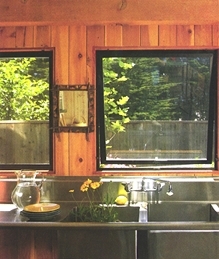 The kitchen is outfitted with an institutional sink-and-counter unit in stainless steel. Inexpensive open metal racks, crowned with cast concrete countertops that McKenzie designed herself (they’re infused with turquoise pigment before setting), take the place of costly built-in cabinets. The stairs leading to the sleeping loft on the second floor are covered in dimpled “diamond plate” vinyl, which mimics the sturdy steel treads of loading-dock steps for a fraction of the cost. McKenzie’s one indulgence: a six-burner restaurant stove and oven. The home’s master bedroom loft is reached by stairs with railings made from standard-issue copper pipe. 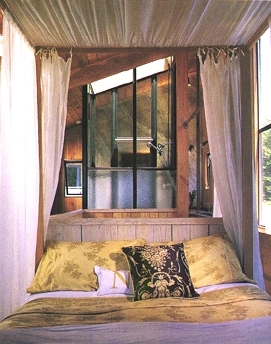 (Copper tubing was used as curtain rods.) McKenzie and Lyndon shaved nearly $6,000. from the cost of a shower stall by devising an ingenious glass enclosure made from anodized aluminum window frames instead of glass bricks. 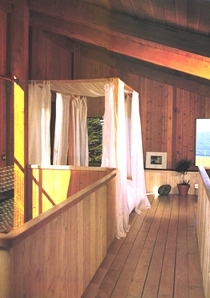 Gauzy rip-stop nylon substitutes for silk swags draping the four-posted bed, designed by the owner and executed in white birch. Lighting is provided by industrial floods. (“The light bulbs cost more than the fixtures,” notes McKenzie), and by recessed incandescent units in the kitchen.